Robert Llewellyn is an actor, writer and presenter. He is probably best-known for presenting Scrapheap Challenge and playing the role of ‘Kryten’ in the hit science fiction sitcom Red Dwarf. 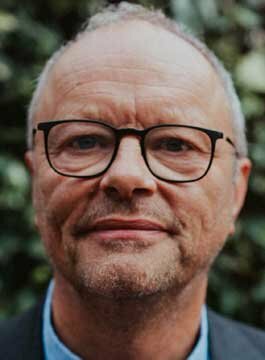 Born in 1956, Robert Llewellyn went to school in the small market town of Witney. After being thrown out of Henry Box school age 15, due to a misunderstanding over general discipline and hair length, he became a hippy leatherworker. Aged 18 became an apprentice shoemaker with James Taylor and Son, bespoke shoemakers in Marylebone, London. He then bought a 5-ton furniture truck, converted it into a house and spent 2 years ‘on the road,’ working on film locations as a runner, a model for painters, a geodesic dome builder and part-time tree surgeon. During this time Robert helped organise a few amateur cabaret evenings in a riverside warehouse overlooking Tower Bridge in London. The shows were a great success and he eventually helped form an ‘alternative comedy’ theatre group called The Joeys. Within six months he had stopped making shoes and started performing professionally. For the following five years he toured Europe with The Joeys, performing an average of 250 shows a year. The Joeys made numerous television appearances and ran sell-out shows at the Edinburgh Festival. In 1985 the group split. In 1989, Robert Llewellyn joined the cast of Red Dwarf and continued in the role of Kryten until the end of Series 8 in 1999. Furthermore, in 2010 Robert started the online series Fully Charged which focused on the emerging electric car and renewable energy sector. This has led him to write for numerous websites, newspapers and magazines on related topics. Llewellyn is the author of several books, including Sudden Wealth, The Man in the Rubber Mask and Some Old Bloke. Robert Llewellyn is available for speaking engagements and awards hosting.